Charlotte corporate chair massage services available for your corporate wellness program or as a great gift for employee appreciation events. 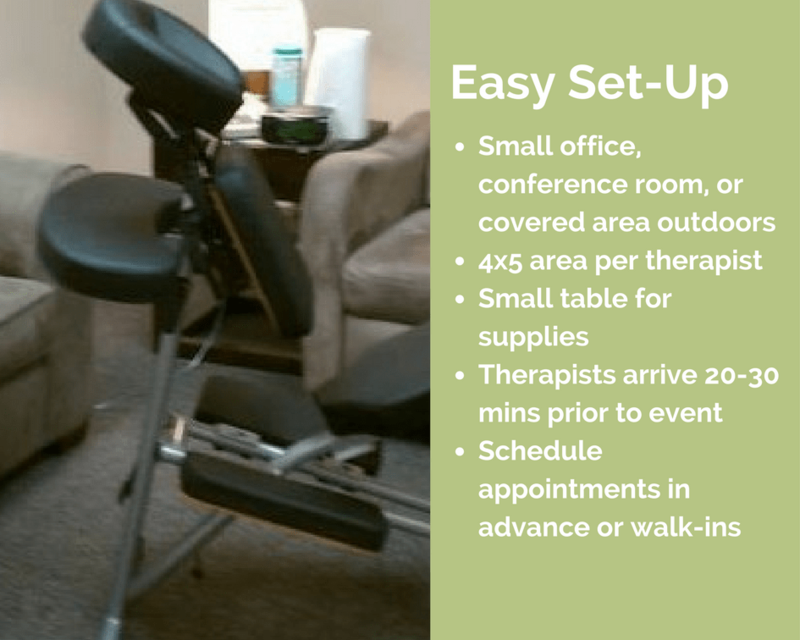 Our mobile chair massage services are available on-site at your office throughout the Charlotte, North Carolina area. Our therapists use a combination of chair massage therapy techniques such as swedish massage trigger point therapy, myofascial release, and stretching. Massage therapy helps reduce muscle tension in the body decreasing chronic pain and stress. Tightness in the muscles can contribute to headaches, sciatica, tendonitis, and low back pain. Offer your employees on-site chair massage at the workplace as part of your corporate wellness program offering. Providing chair massage on a monthly or quarterly basis is a very popular way to engage your employees in stress management reduction strategies. 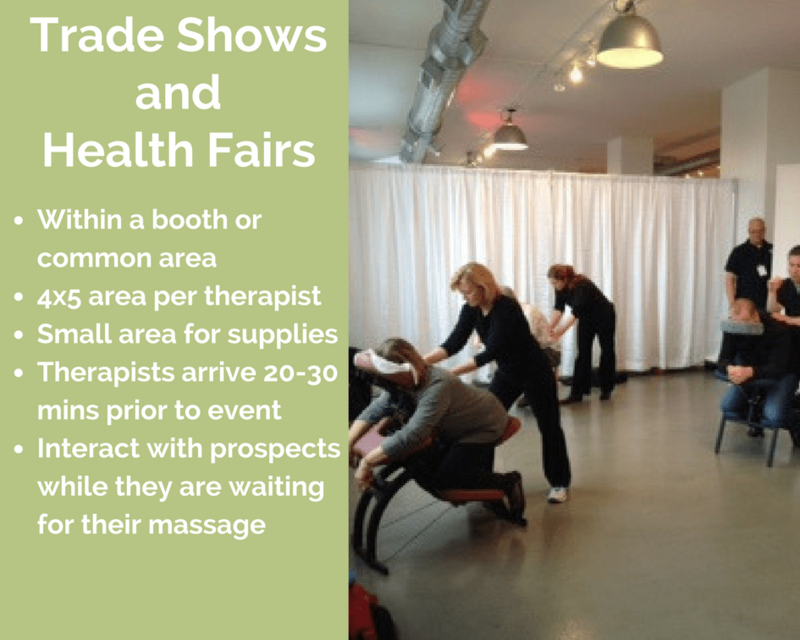 If your company hosts health fairs for your employees, chair massage is a fun activity to add. Employees will look forward to this service and it will increase employee participation in your health fair. Before or after their chair massage, they will browse and interact with your insurance providers and other health fair participants. Consider having chair massage for the entire event or during peak times. One or multiple therapists are available to support your health fair traffic. Chair massage is a popular way to recognize your employees and show them appreciation. Consider this for a holiday party, customer service week, administrative week, company picnic/BBQ, etc. It is also a great stress reliever for employees working on large, intense projects and implementations. When it’s difficult to get away from the office and take a break, you can bring the relief right to them. We’ve had employees tell us the only way they were able to get through the day was knowing they were going to enjoy a chair massage soon. Give your customers a thank you they’ll remember. Our therapists are available to provide chair massages at your customer’s location or at a customer appreciation event. Your customers will thank you for this gift for months after the event. Chair massage services helps your company develop relationships with prospects and deepen relationships with vendors and customers. Providing chair massage at your trade shows booth draws an audience and provides great exposure for your products and services. It is also a great way to say “Thank you” to your vendors and customers. Your company representatives have an opportunity to interact and develop relationships with prospects and deepen relationships with vendors and customers while your guests are waiting their turn for a massage. Our therapists can support your marketing efforts by communicating your marketing message and distributing marketing materials at the events. Give us a call and we can help you develop a strategy for your next trade show. Chair massage is a fun addition to your customer appreciation or community event. Give us a call for your grand opening, anniversary celebration, open house, new product demos, etc. Call us and we will help you develop a strategy for your customer appreciation event. Chair massage is also great for bridal parties, baby showers, birthday parties, ladies night and more. It is a popular activity for all ages to enjoy. Contact us for chair massage rates and proposal for your event.